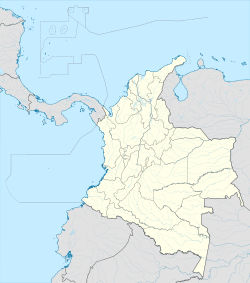 Popayán (Spanish pronunciation: [popaˈʝan]) is the capital of the Colombian department of Cauca. It is located in southwestern Colombia between the Western Mountain Range and Central Mountain Range. It has a population of 258,653 people, an area of 512 km2, is located 1760 meters above sea level, and has an average temperature of 18 °C. Much of the city's original splendor was destroyed on 31 March 1983, when an earthquake toppled many buildings. Though many were rebuilt and repaired, the heart of the city still has ruins and empty lots. In 2005, Popayán was declared by the UNESCO as the first city of gastronomy because of its variety and meaning to the intangible patrimony of Colombian culture. The culinary history of the Cauca Department was chosen because it maintains traditional food preparation methods that have been passed down orally for generations. In 2009, UNESCO also declared the Semana Santa processions during Easter Week a Masterpiece of the Oral and Intangible Patrimony of Humanity. The word Popayán comes from an indigenous language. There are different theories about the origin of this word, one claims it means: Po: "Two"; pa: "reed"; yan: "village", or; "Two villages with reed roofs". Another theory says that the word Popayán comes from the name of the indigenous cacique, called Payán, who used to live around Eme Hill, nowadays known as Las Tres Cruces Hill. Yet another theory says that according to the historian Arcecio Aragón, the origin of the word Popayán is "Pampayán" from the Quechua language: pampa (valley) and yan (river), thus, the "valley of the river", where "river" refers to the Cauca River. Popayán was a very important town during the colonial period because of its location between Lima, Quito and Cartagena. Even after the discovery of the Pacific Ocean, Popayán remained a transfer point for gold and other riches going to Cartagena on their way to Spain. Popayán also served as a colonial mine, and produced various denominations of gold escudo coins and silver reales from 1760 through 1819; it continued producing coinage for the new Republic of Colombia after 1826. The city is the home of an ancient pre-Hispanic pyramid known as El Morro del Tulcán, already abandoned when the first Spanish arrived. Analyses of dental samples have revealed that individuals buried there probably belonged to the upper class of their society. Popayán's historic downtown includes examples of colonial architecture which has been preserved for more than four centuries. The cobblestone streets were almost all paved in 1937; however, a few projects currently seek to recover the old city's original look. Better known as the Paraninfo, this imposing mid-18th-century building was part of the Dominican order monastery until 1826. It was first built with a mud and straw roof, then reinforced over the years with rammed earth and tile. In 1827 Simón Bolivar declared it a property with historic heritage value, when it was already a two steps hose[clarification needed] in front of the Santo Domingo plaza. The last great governor of Cauca, Don Miguel de Arroyo Hurtado, made more renovations and reforms that gave it the most current look. When the building was given to the University of Cauca in the early twentieth century, several changes and additional extensions were made, which recovered all the original spaces. This park was born at the same time as Popayán in 1537, when the track in grid generated around religious, governmental, and founders buildings. [clarification needed] Initially it was a marketplace. In 1538 a trap was placed in the center of the park, where Jorge Robledo and Álvaro Oyón were beheaded. The trap lasted until 1766 when it was replaced by a water faucet, which remained until 1805 when a stone pile was put in its place, but it was removed too in 1910 after the inauguration of the monument to Sabio Caldas, a piece by the French sculptor Raoul Verlet [fr], which has stood there since. A replica of it exists in the Plazoleta de las Nieves in Bogotá. Leafy trees were planted at this time. In May 2007 a proposal by architect Lorenzo Castro aimed to expand the pedestrian zone around the park, and in April 2009 the first phase of the work began. This country house was built in the 17th Century. On its grounds a battle was fought for the independence of Colombia on January 15, 1814. According to the architect, critic and historian Germain Téllez, the facade of this church is the best example of baroque style in Colombia. In its tower is a bell donated by Don Pedro Agustín de Valencia. This temple is remarkable because of its altar decorations and the proportions of its naves and apse. In San Francisco's square stands a monument to local hero Camilo Torres, whose replica is located in the square of the Colegio Mayor de San Bartolomé in Bogotá. These processions represent episodes from the Gospels, relating the Passion, crucifixion and death of Jesus Christ. Each representation is called a "Paso". Since the time of the conquest the pasos have been carried through the streets on the shoulders of the traditional 'cargueros' in a route shaped like a cross, which takes in the main churches and temples of the city. Since 2009 the Popayán Holy Week processions have been inscribed in the UNESCO Intangible Cultural Heritage Lists. Amo Jesus Nazareno of Puelenje is a Catholic devotional image located in the church of Puelenje, part of the metropolitan area of Popayán, Colombia. Amo Jesus is the patron of the parish of Puelenje. The image is a polychrome baroque wooden sculpture of Jesus Christ carved in the eighteenth century in the style of the Quito school. The image is processed on the Wednesday as part of the expression of popular piety celebrated in Popayán during Holy Week (see above). A festival in honour of Amo Jesus as patron of the parish is celebrated with fireworks, processions, religious ceremonies and cultural events beginning on the 15th day before the last Sunday in August each year. It is said that among the original performers there were good music interpreters, excelling in playing the chirimía, that is made up of flutes (transverse cane), guacharacas, drums, castrueras and triángulos, making its appearance in the traditional celebrations of Popayán, especially at Christmas time and at the end of the year. Popayán has been declared a City of Gastronomy by UNESCO, in tribute to its significant tradition of regional cooking. Typical dishes of the city are a legacy of both Spanish and indigenous cultural interaction, integrating components of local origin with fruits brought from Spain. The National Gastronomy Congress of Popayán has been held each September since 2003, and in 2005 was recognized by UNESCO as a cultural heritage event of the United Nations creative network. The Congress is organized by the Gastronomic Corporation of Popayán, which has presented seven events which have also featured the participation of various countries as special guests: Peru, Brazil, Spain, Chile, Mexico, Italy and France. Carantanta [es]: a type of fried corn snack placed in the pot where corn dough has been made. Soups: Shaked Broth[clarification needed], Sancocho, tortilla soup, Sango[clarification needed], carantanta [es] soup, wrappes soup, vegetable and pastries soup. Christmas Eve plate or dish is very special. Its content is the most complete of Colombia and consists of hojaldra [es], rosquillas, manjar blanco, dulce cortado, natillas and fig syrups, among others. The average temperature of 17.8 °C places the city in the warm-temperate zone. Popayán has a highland subtropical climate but as precipitation is high even in the driest month, Köppen defines it as Cfb (in the bordeline of the Af - equatorial climate), without direct relation to the term used. Being in the northern hemisphere, some Mediterranean characteristics are observed as a summer much drier than winter, but still quite humid. ^ See the entry in the website, accessed 4 April 2015. ^ See the description on the website, accessed 4 April 2015. ^ "Popayan, Colombia Köppen Climate Classification (Weatherbase)". Weatherbase. Retrieved 2019-02-15. ^ "Clima Popayán: Temperatura, Tempo e Dados climatológicos Popayán - Climate-Data.org". pt.climate-data.org. Retrieved 2019-02-15. Wikimedia Commons has media related to Popayán.